Article 43 of the Ethiopian Constitution declares that all Ethiopians have the right to development and citizens have the right to participate in national development and, in particular, to be consulted with respect to policies and projects affecting their community. Moreover , as per article 41 of the Constitution: “Every Ethiopian has the right to engage freely in economic activity and to pursue a livelihood of his choice anywhere within the national territory and the right to choose his or her means of livelihood, occupation and profession.” In addition, article 44 ensures that all persons who have been displaced or whose livelihoods have been adversely affected as a result of state programs have the right to get compensation from the state. The government has also managed to reduce infant and maternal mortality rates to some extent. Though Ethiopia has laid the legal foundations for the right to food, there is much to be done from explicit legal prescription to enforcement. The government has been heard constantly saying “if we have money, we can buy food from the market”. This is an irrational and ignorant policy which is not informed by a basic understanding of the current Global Corporate Food regime. After the 2008 economic crisis, the market is no more a reliable source of food even for developed countries. Though we need food sovereignty oriented policies, the recent large scale land investments seem to reflect the contrary. For instance, investors are encouraged to export crops rather than providing to the local market in the midst of high inflation on food prices and mass eviction of people for those investments. It seems that the government approaches food insecurity as a problem caused by food shortage (traditional approach to food security), while that is not always the case. Hunger is experienced in a country where there is a surplus in food. There are also other factors, argues Amarty Sen, which lead to deprivation, such as lack of entitlement- production menses. 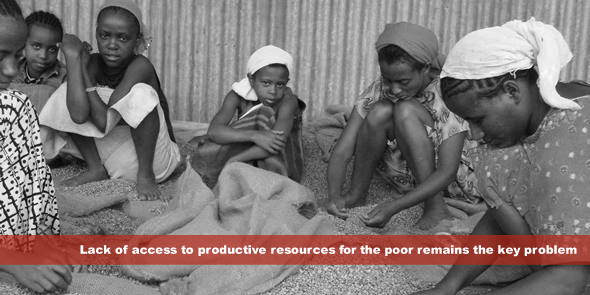 Lack of access to productive resources for the poor remains the key problem in Ethiopia. Looking at the political structure of the country, human right institutions are not developed and the government restricts democratic rights, let alone economic and social and cultural rights, that require strong commitment from the side of the government. The new civil society’s law restricts domestic civil societies and international rights based non-governmental organisations (NGOs) from advocacy activities. There evidence, for example India and Brazil, suggesting that in countries where the right to food is well established, a decreasing trend of hunger in consequential. In 2001, NGOs in India started challenging the government’s policy on the right to food. These law suits resulted in a variety of rulings that addressed access to food. The courts ordered the government to inform the concerned population about its legal right to food. These orders have also had important practical effects. Indian courts were active in firmly establishing the right to food in the legal framework. Thus, India’s experience shows the contribution of democracy towards strengthening the right to food and thereby eradicating hunger. The Ethiopian People’s Revolutionary Democratic Front’s (Ethiopia’s governing party) policy documents declare that it is a revolutionary developmental state. It seeks its legitimacy from its economic achievements rather than free and democratic elections. Hence it is highly unlikely that a democratic state evolve out of developmental state ideology. The government claims that development in general, and in particular food security, should come first before political rights, even though research and experience from other countries prove the inseparable link between rights and development. Therefore, the development of the right to food should also be read together with the progressive nature of the democratic system. Ethiopia needs strong and independent courts and civil society activists working on the right to food. The weakness of the democratic and legal structures could make food security a myth. Bereket Kefyalew is a recent Graduate with MSC in International Relations and Development from Aalborg University, Denmark. The author also holds a Bachelor Degree in Laws (LLB) from Mekelle University, Ethiopia. He has taught at the Hawassa University, Ethiopia and other colleges for nearly three years. Currently, Bereket Kefyalew is a freelancer based in Copenhagen, Denmark. I want to do like you b/c we are the result and out put of him. carry on in it. I don’t miss to thank pro. Mammo for his great contribution on building our knowledge. by the way He teach me Developmental Economics. Keep in touch and let’s make Africa a free, open and democratic community via enforcement of the freedom from hunger, in first and foremost place!